It's easy to get freaked out on a solo trip through barren wilderness, especially when your job is waiting for it to catch on fire. Here's our first look at Firewatch in action. 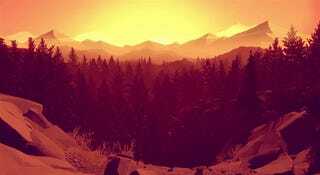 Set in the gorgeous Wyoming wilderness, Campo Santo's Firewatch is a first-person adventure game where your only link to civilization is the person on the other end of your radio. We've seen art from the game, now let's see it in motion. From the trailer it sounds as if your character begins to unravel as the game goes on. Poor Henry sounds like he's losing it, alone in the middle of an area that could be engulfed by flames at any moment. Plus there's a mystery to solve. I'd go a little nuts too. Firewatch is due out in 2015 for PC, Mac and Linux. Keep track of the game's development at the Campo Santo website.